In 1957, when the New York Giants moved to San Francisco, Willie Mays (above), their star center fielder, began looking for a Bay Area home. What followed was a fiasco—but from it all Mays and Eichler Homes came together. He was one of the most admired men in America, and best liked as well. Willie Mays, baseball's 'Say Hey Kid' of the 1950s who went on to become the greatest player ever, could hit and steal bases like no one else. And his fielding? Well, consider 'The Catch,' as it's still called, when the star center fielder hauled in what should have been an uncatchable ball in the 1954 World Series, then whirled and fired back a perfect run-saving strike. Plus, Willie Mays was simply a nice guy, "friendly as a kitten," in the words of Colliers magazine—a bit naïve at first, even goofy in a likable way—losing his hat on the field, not quite knowing how to handle money, too generous with his sudden prosperity. What's more, he loved the game, and it showed. "Willie is, above all, happy to be playing baseball," Sports Illustrated wrote in 1954, "and he makes everyone who sees him feel happy, too." In his off hours Willie played stickball in his New York neighborhood with the local kids—for real, not for the press. A swell guy, sure. But would you want him for your next-door neighbor? In 1957, after the New York Giants announced that, in 1958, they would move to San Francisco, Mays and his wife, Marghuerite, came to the City by the Bay to get acquainted with the place—and find a nest. Willie was all of 26. What happened next brought shame to a city that, while not yet the liberal bastion it has since become, was celebrated as easygoing and filled with free thinkers. 'Willie Mays is denied S.F. House – Race Issue,' the San Francisco Chronicle blared in huge type above the masthead on November 14, 1957. "Willie Mays, the spectacular center fielder of San Francisco's newly acquired Giants, ran into the color barrier here yesterday," the story went on, calling Mays "the most powerful drawing card on the Giants roster." 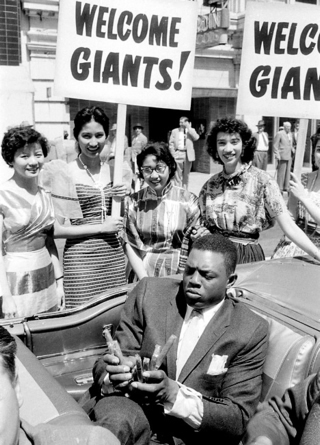 Signing autographs at the Giants downtown parade, April 1958. 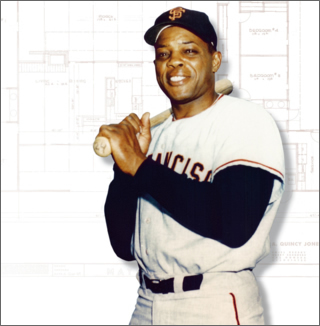 The story of how housing developers in the city refused to sell to Willie Mays because he was black makes clear, in stark terms, just how unusual it was that another developer, Joe Eichler, would sell to anyone of any race. The story also conjures up some mysteries. How did Willie Mays come to know Joe Eichler? Why did he ask Eichler, a little more than a year after being spurned by San Francisco homebuilders, to build a house for himself and his wife? Had Mays simply heard of Eichler's nondiscrimination policy? Or did he just love the man's style? Or had they met earlier, perhaps during this incident of discrimination? And why was Mays' Eichler home never built? In fall 1957, Willie and Marghuerite found what seemed to be an ideal house—newly built, three easy miles from the Giants' temporary home, Seals Stadium. The house was quietly modern, with a band of sliding glass that opened to a view of the Pacific. We'll take it, Marghuerite told the builder, paying $100 down. The couple was prepared to pay the rest of the $37,500 price in cash. Next thing they knew, the house was taken off the market. It wasn't hard to figure out why. The neighborhood, Miraloma Park, was "all-white," according to the Associated Press. And the Mayses had had a similar experience two weeks before when they'd made an offer on another house. This time, however, they were not prepared to walk away. "It's a nice place with a good view," Willie said, "and we want to live here."